The Federal Communications Commission got its hands on a new model of Samsung's Galaxy Tab 2 7.0 that will play nice with Verizon's networks. The tablet comes equipped with a new bundle of wireless radios that are compatible with Verizon's LTE service, the FCC confirms. Other than Verizon support, this 7-inch tablet is exactly the same hardware that recently hit store shelves. While Samsung's low-cost tablet has cut some design corners, it's still an impressive device on a budget. 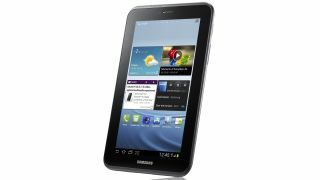 The 7-inch display packs a 1024x600 resolution coupled with a 1GHz dual-core processor and Android's Ice Cream Sandwich OS. The quality media playback makes it a viable competitor to the Kindle Fire and Apple iPad for those who put size and price as their chief concerns. There was no official launch date announced, but sources point to the tablet arriving on Verizon shelves soon.